While there are a number of sources that attribute the origin of this phrase to R.L. Stevenson's Treasure Island (pub. 1883), or alternatively, to the National Biscuit Company (Nabisco, c. 1876) which used it as a popular slogan, neither of them appears to be the right one. As James McLeod has pointed out in another answer, "Polly want a cracker" can be verified to have been in use even before these dates. The use of cracker in the cartoon is a pun on the word for the biscuit as well as the fact that the boy is ready to crack the skull of the parrot open, presumably for annoying him (perhaps by asking him for a cracker?). The hosts of the show go on further to make a connection between the use of crackers on ships (as long-lasting food) and perhaps parrots being on board as well. At any rate, they conclude that even in 1848, parrots named Polly wanted crackers and that the phrase might have been commonly used. Polly is a diminutive of Poll "as a female name, and name for a parrot," and Poll, altered from Moll, familiar form of Mary, is the traditional name for any parrot. The earliest quotation the OED gives for Polly as a name or designation for a parrot is from Ben Jonson's "Epigrams," 1616. I'm not a parrot-fancier, but I suspect it may be easier to get a parrot to produce a recognisable rendition of the word "cracker" than "seed". Parrots can be taught to say all sorts of things. I remember being in a dingily-lit country pub many years ago. Myself and my lady companion seemed to be the only customers, but every few minutes a voice coming from somewhere in the murk kept saying "I've got my beady little eye on you!". We were excruciatingly embarrassed for some time (we certainly stopped canoodling in the corner!). But then we heard "Pieces of eight! Pieces of eight! ", and it finally dawned on us! Strangely, as I recall, it never said that other old standard for parrots - "Who's a pretty boy, then?" The earliest reference I can find is 1859, but I should think it was a fairly standard thing to teach parrots long before that. Bear in mind that usually (always?) the parrot has no concept of the meaning of whatever it says - after all, it is a bird-brain. "Ah! Isn't he cute! He wants a bite of our hard tack, too!" ...and offer the parrot bits of their ration. Okay - I know archetypal sailors would say "Arrggghhhh! ", but the point is they probably wouldn't have seed on board, so the "anthropomorphism" wouldn't work with that version. And the parrot often wouldn't be saying either version because he actually wanted anything to eat at all, let alone a specific food (he just likes attention). So from his point of view it's irrelevant what word he says. A familiar equivalent of the name Mary (see also Polly1), used as the conventional proper name of any parrot; hence, = parrot. So Poll-ˈparrot, also used fig., and attrib., with reference to the parrot's unintelligent repetition of words. Why is the parrot named Polly? And we will haue no Pooly' or Parrot by. Fast. Would you speake to mee Sir? Carl. I, when he has recouered himselfe: poore Poll. So the female forename Polly comes from the female forename Poll (also Pall), and was originally a rhyming variant of Moll, which is a diminutive of Mary. 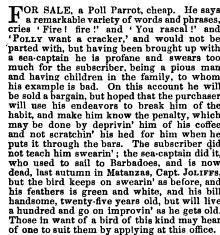 Daniel Defoe's Robinson Crusoe (1719) named his parrot Poll and taught him to speak, and in a much later 1894 children's version the parrot said "Polly wants a cracker, cracker." Why doesn't she want seeds? 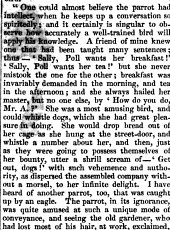 A friend of mine knew one that had been taught many sentences ; thus - ' Sally, Poll wants her breakfast !' ' Sally, Poll wants her tea !' but she never mistook the one for the other ; breakfast was invariably demanded in the morning, and tea in the afternoon. I am not sure if it is possible to answer this question. "Polly" is a traditional name for a parrot, dating back an awfully long time (as is the expression, as shown by this Google NGram. Perhaps a cracker is a special treat to be offered as a change from seed? The Parrot is called Pol, i.e. Polly, already in John Skelton's Speke, Parrot (1521), where it wants an almond, crackers not having been invented yet. Wow, is this a Nirvana reference? Polly is a parakeet also used in this way. It's a derogatory way of saying, I'll give you a minor reward for doing what I tell you to do... and it has been conditioned to comply. Why do they call a murder a “red ball” case? What does the expression “for crying out loud” mean?